The manual wheelchair Ki Mobility Tsunami ALX with its sleek look and ultra light rigid frame, offer a more responsive ride at an affordable price. As a 20% stiffer and more responsive chair in its highest price range market, the Tsunami ALX stands out with an 11.2lb transport weight and as a product that doesn’t need to sacrifice quality, design or features to offer a competitive price. Its large option availability allows users to customize their ride to their needs, while the aluminum 7000 series construction brings stability and maneuverability at a low weight, allowing it to take you wherever you need to go. Just because it comes at a lower price than many competitors, doesn’t mean the manual wheelchair Ki Mobility Tsunami ALX is at all lacking. 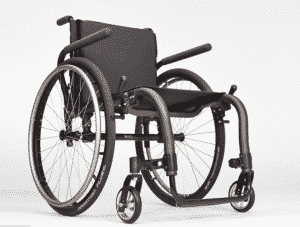 Its improved design and innovative technology make it arguably the best choice in the market for manual wheelchairs. With a wide range of styles and positioning to choose from, the Tsunami ALX comes with more front-frame bend options, tapers and colors than any other similar product in its field. A tubular component system provides an individual seat height setting without needing any extra clutter of hardware, with the feature of adjusting the seat up and down in ¼” increments to provide a sleek, clean appearance and improved stiffness. By employing the ingenious Crescent CG system, the side frame is kept free of excess hardware but remains infinitely adjustable. This makes it a comfortable ride that includes adjustable footplates, stronger and precise wheels and precision machined aluminum caster housings, all adding to the responsiveness and durability of your ride. As experts in the field of mobility, we are proud to introduce to our customers products, such as the manual wheelchair Ki Mobility Tsunami ALX, as a powerful ride at an affordable price. Contact us today to find out more or visit our showroom and come test it for yourself.